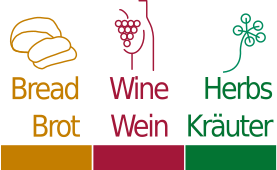 Welcome to our website of the project “Tastes of Danube: Bread, Wine, Herbs”! The website navigation is largely held in English in order to represent this international project along the Danube cross-lingual. On this country website we inform you how you can navigate through the website in order to get more detailed information about the project and we lead you to the main information. In January 2016, after a three month pilot phase, the Danube-Networkers started the project „Tastes of Danube.Bread.Wine.Herbs“, which welcomes civil society organizations active in the areas of education, culture, social and environmental fields, higher education colleges and schools to join the project. Right now, 11 countries of the Danube Region participate. On March 15th, 2016 the activity “Bread on Tour” started. The basic idea is to take a “primal bread dough” along the Danube river and through the Danube Region countries by bike, by foot, by car or plane and will reach cities and communities. On the 10th of July 2016 from 10.30 a.m. to 1.30 p.m. a danube breakfast on the Herdbrücke of Ulm/Neu-Ulm will take place in the frame of the International Danube Festival, Ulm/Neu-Ulm. The office of ILEU e.V./DANET e.V.